Discover new and exciting ways to fly with the Silverlit M.I. Hover! 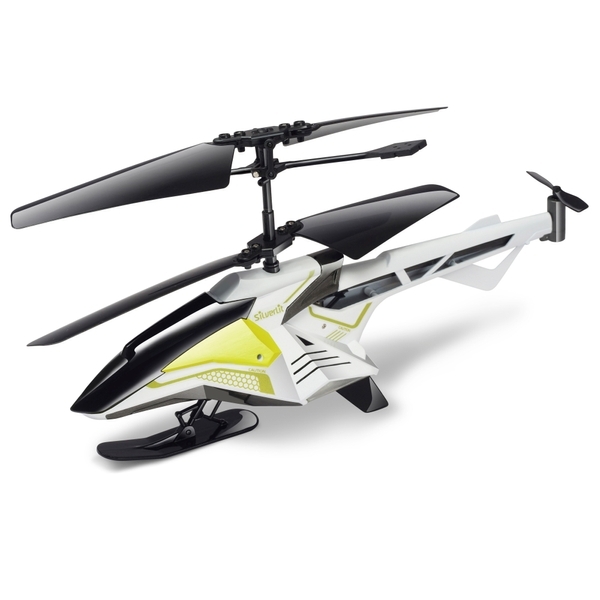 This agile helicopter features auto-hover and gesture tilt control, giving you even more piloting options. Motion Intelligent Flying allows you to guide the Silverlit M.I. Hover with your gestures. Simply tilt the controller downward to move the helicopter forward and upward to reverse. Gesture tilt controls enable you to turn the aircraft left or right just by rotating your wrist! The remote control also features throttle control, one-touch take-off, one-touch landing and light controls. The Silverlit M.I. Hover is controlled by 3 channel super wide infrared. It has a precise variable speed rotor for better flying control. The built in gyro stabilising technology helps to keep your flight stable and improves hovering in a fixed position. Activate the Silverlit M.I. Hover’s lights while hovering for an amazing light show. This agile helicopter features a lightweight white body, black propellers and black and acidreen details on the body for a sleek finish. Flying helicopters requires a certain level of skill. Practice flying in an obstacle-free area and be prepared for the inevitable bump and crash as you learn to fly. Not suitable for younger children.